Ebenezer Ward and George Lock established Ward & Lock in 1854. 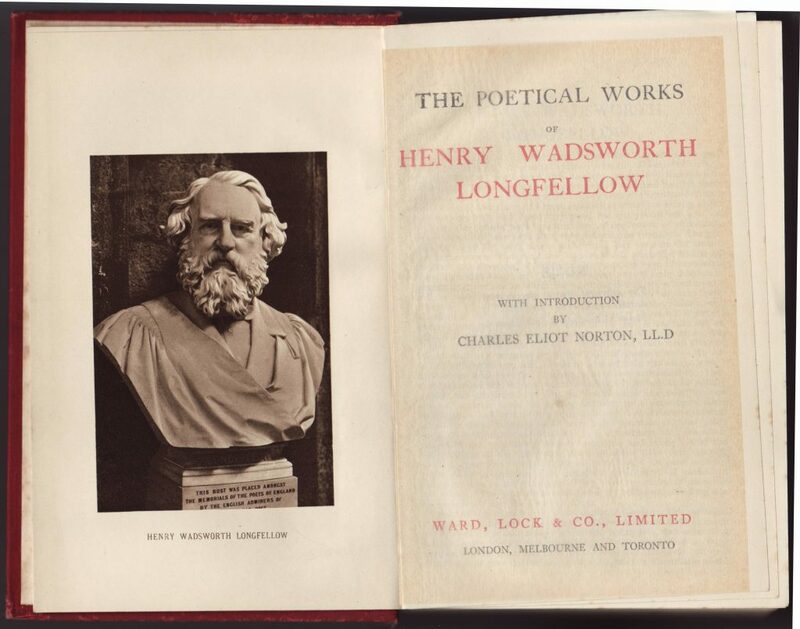 They are known for publishing the Red Guides as well as early Sherlock Holmes stories. The company was split up and sold in 1964. Ward, Lock & Co.’s Series of The Great Poets (sometimes just The Great Poets) debuted rather inconspicuously in 1910 (The Publisher, Volume 93, 1910). 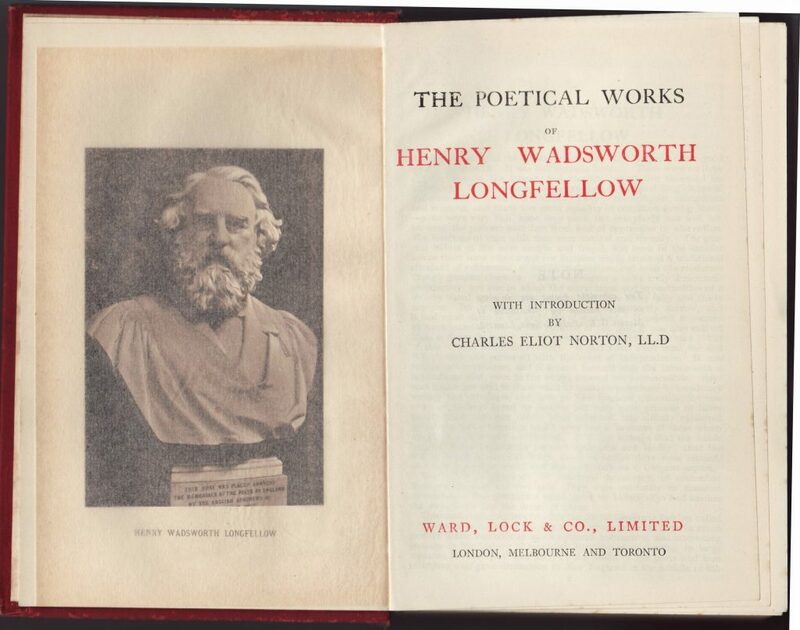 Many of the titles are shared with earlier Ward, Lock & Co. books, and this series may be simply a repackaging of earlier titles. 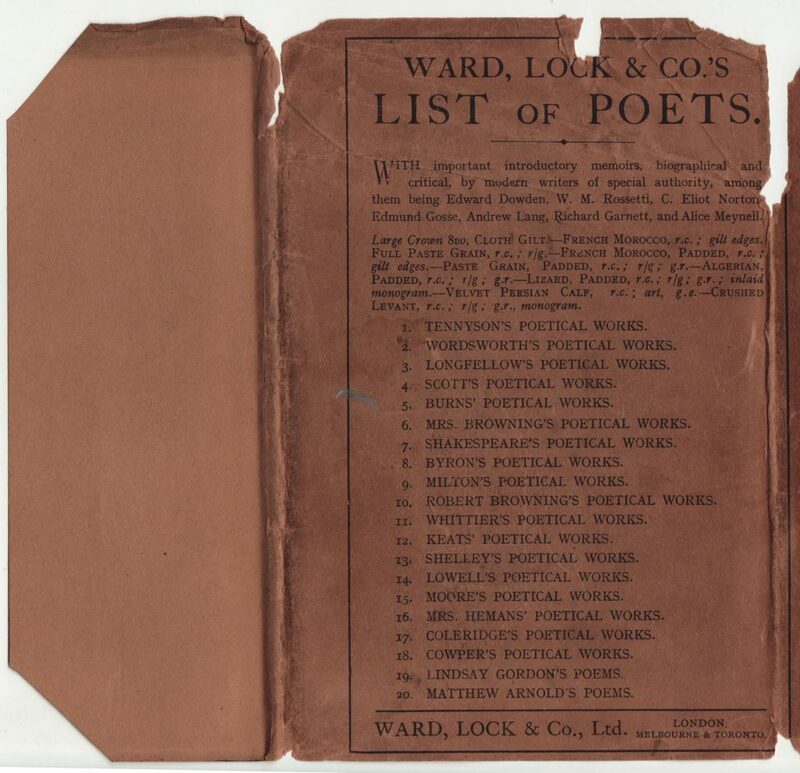 The Great Poets series seemed to get very little advertising over its relatively long span of availability, mostly appearing in books in print reference materials. The majority of titles seem to have been issued in the 1910-1920 era, although some reprints with the series name appear in 1951. Jackets do vary over time, with color jackets appearing on later issues. 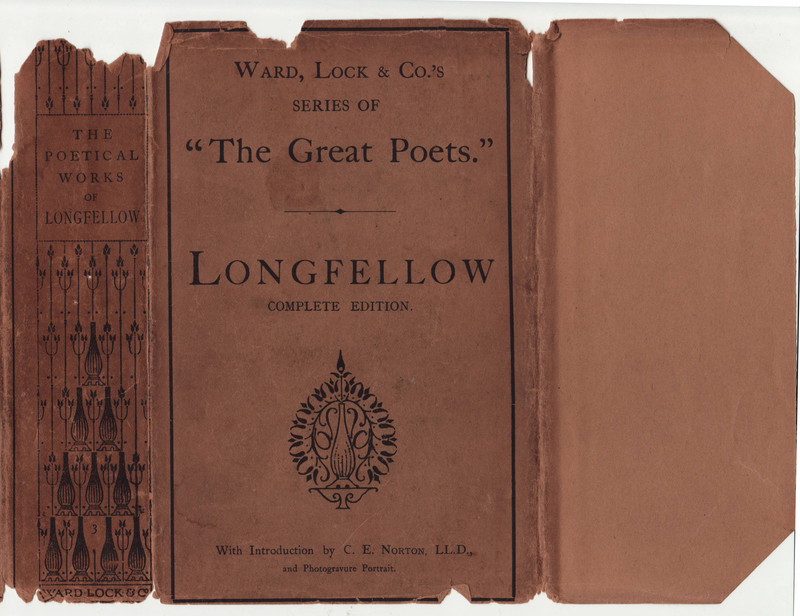 This copy of Longfellow’s poems is undated but probably printed in the early teens. A gift inscription in the book is dated 1914. These books seemed to be popular as school prizes (at least among the teachers awarding them). The spine has a graphic design that mimics the book spine (see below). The jacket front includes the series name. The series name only appears on the jacket (making series titles difficult to identify if they do not have a jacket). The front jacket flap is blank. 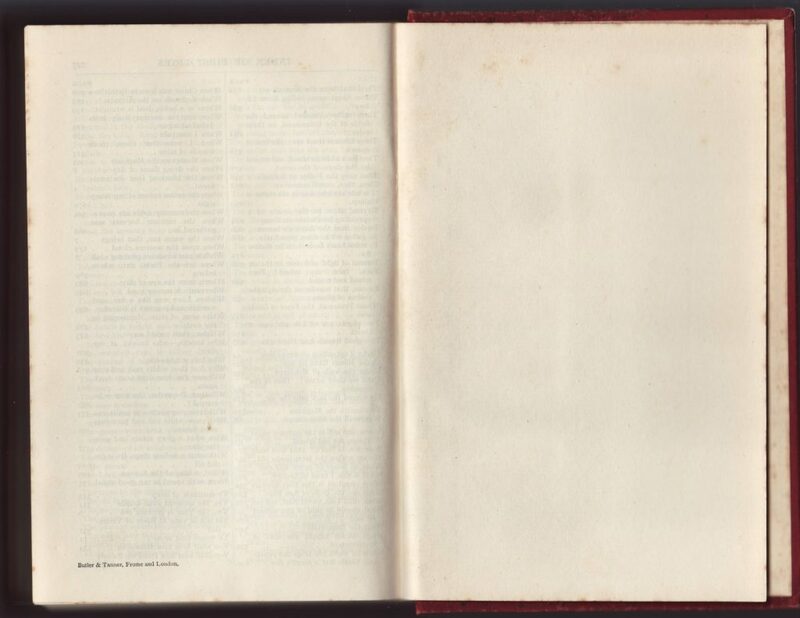 The rear jacket flap is also blank, and a listing of the series titles, 20 in all, covers the back of the jacket. There is a multitude of available bindings, including cloth gilt (this copy), French Morocco, Full Paste Grain, French Morocco Padded, Algerian Padded, Lizard Padded, Velvet Persian Calf, and Crushed Levant. 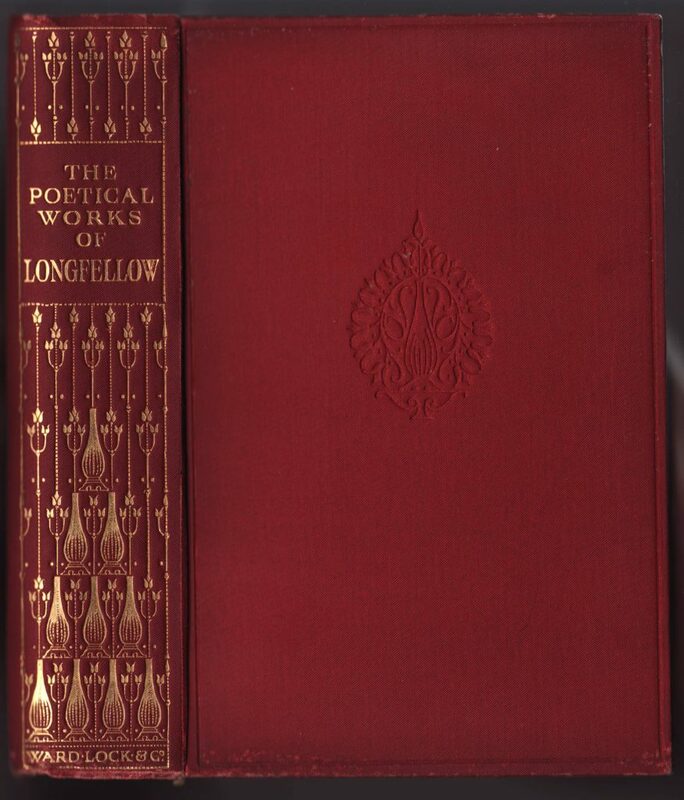 Red cloth binding with designs on the spine following those on the jacket spine. A debossed design on the front of the book. The series name is nowhere in or on the book itself. 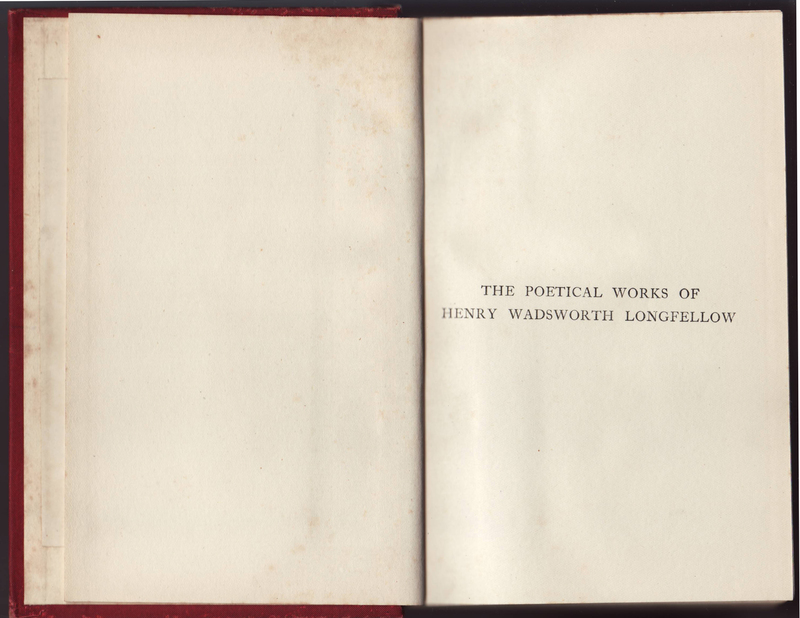 A frontispiece faces the title page. 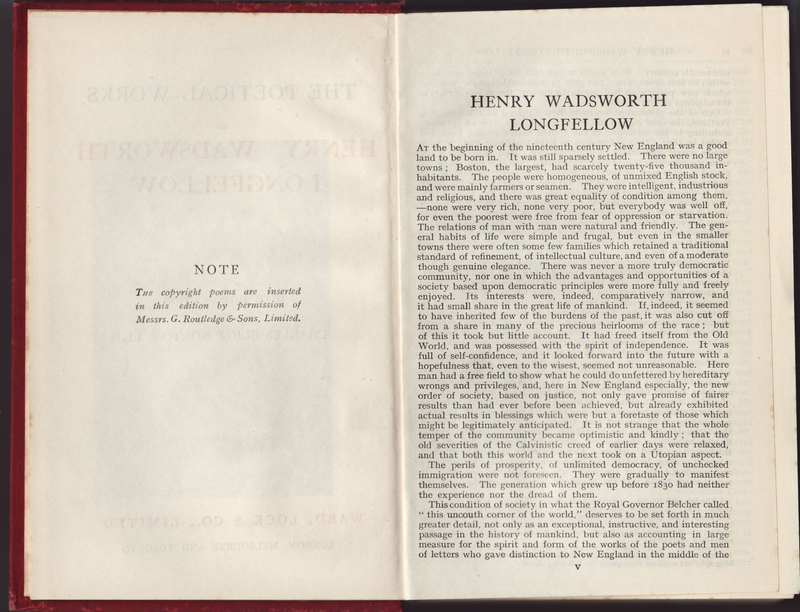 A note about copyrighted poems included by agreement with Routledge & Sons, Ltd. The printer is Butler & Tanner, Frome & London. The printer type is left justified on the page.